Handles plates up to 8 ft. in width and 5" in thickness. Available with one or two independent spindles for maximizing the productivity. Spindle speeds up to 3,000 RPM is provided with a 44 HP drive. High performance spindles with a ball screw feed and fixed spindle design to fully utilize carbide tools for drilling rates up to 60 inches per minute. 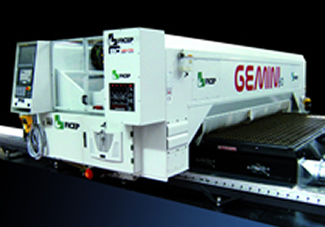 Multiple torch Oxy-fuel and plasma cutting systems. Guaranteed accuracy with rack and pinion positioning and measuring systems on stock material regardless of the edge condition of the stock plate. The datum line carriage system eliminates the potential of horizontal clamps collapsing the skeleton. 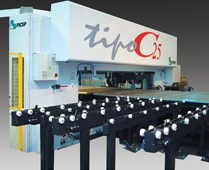 Irregular stock plates or drops can be returned to stock and later utilized without having to make a square cut to start the CNC process. 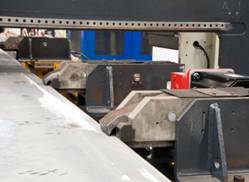 The datum line carriage system maximizes material utilization to minimize scrap. Guaranteed accuracy regardless of rust and mill scale. 6 or 12 position automatic tool changer. Guaranteed accuracy on large and small parts. Maximum accuracy is assured regardless of where they are nested in the stock plate. 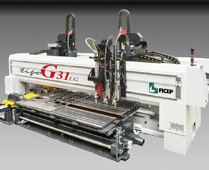 The Ficep drill spindle design features a ball screw feed that is consistent with today's machining center designs. Available with one or two independent drill heads for enhanced productivity. This design permits the tool to advance through the material at a uniform feed rate that is coordinated and maintained by the CNC control. Eliminates the tendency for the drill bit to rapidly accelerate and actually punch through the material upon break through. This is the same system that is used in all CNC machining centers today to achieve maximum metal removal and to be able to fully utilize today's high performance insert tooling to its maximum efficiency. The spindle speed range of the Ficep drilling spindle is also designed to accommodate the RPM (up to 3,000 RPM) requirement of today's high performance insert tools. The entire drill head and spindle are advanced to the material as a single unit rather than just extending the spindle while the gearbox remains stationary to eliminate spindle wobble. Internal and external coolant selected by program command. Full spindle speed range available for all tool positions. Six different tool positions available for each spindle. Simple two position lineal tool rail eliminates the need for encoders. Tool life tracking and automatic selection of a re-sharpened tool when required. 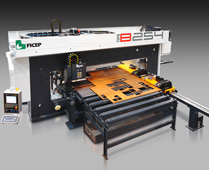 Full programmable scribing system for part marking and the generation of scribing lines. The Ficep Windows based control is provided with the proprietary Ficep software for remote diagnostics through an internet connection.